For a unique and innovative twist on vertical blinds, be sure to check out the Skyline Gliding Window Panels. Their streamlined, modern appearance makes a statement in any room, both on windows, doorwalls . . .or even as a fun and flashy room divider! Constructed of beautiful yet durable vertical panels, Skyline vertical shades are perfect for wider windows or doorwalls that have too long of an expanse for horizontal shades. Unlike traditional vertical blinds – which invariably look messy and uneven – Skyline vertical shades evenly and uniformly glide across any wide window or doorwall. Wide windows and door walls ideally require window treatments that provide privacy and light management when closed, but are also easy open. 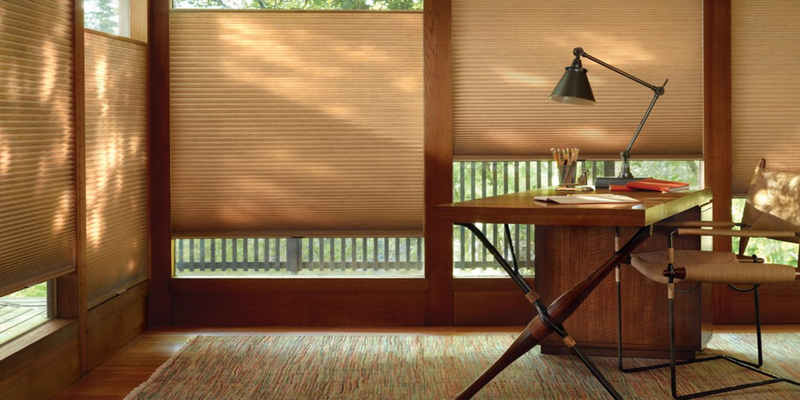 The patented Hunter Douglas Syline vertical shade can be constructed to provide light management for even the widest of windows or doors, while gliding open and shut easily without catching or tangling. Enjoy Skyline Vertical Shades . . .Forever! Traditional vertical blinds are notorious for breaking, falling and tangling. Hunter Douglas patented Skyline vertical system eliminates the issues usually associated with covering a dorrwall or window. Built in the United States with the greatest attention to craftsmanship, should anything ever go awry, Skyline Gliding Window Panels, like all Hunter Douglas window treatments, are covered under the limited lifetime guarantee. Our talented and experienced Interior Designers will come to your home to ensure that you get the window treatments that are perfect for your decor, at a price you can afford. Click Here to set up an appointment with us for a free, in-home consultation. Whether you are looking for innovative colors and patterns in window shades and blinds – or you prefer window coverings neutral or understated, we have the widest selection in Malibu, Westlake Village, Agoura Hills, Calabasas and Ventury County.